A little over a week ago Black Mess Records held a going away show, as the Baltimore based record store’s owners were relocating to the West Coast. 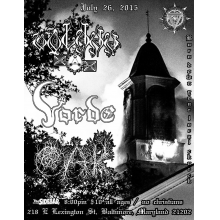 Along with what will likely be the last performance from death/doom band Oak for a while (as vocalist Jo Gonzales is one of the Black Mess owners), this show also served as the Baltimore date for Volahn/Vorde’s East Coast tour. Though I tend to have trouble making it out on Sunday nights, this was one of those lineups that couldn’t be missed and with each performance it was clear that I had made the right decision. My encounters with Oak have been fairly spread out, as they’ve always been one of those local bands that seem to be a bit more selective about what shows they play. Rather than simply jumping on everything, over the past decade the group has played a lot of gigs where they fit in extremely well either stylistically or thematically, which I’ve always liked. The first time I saw them was opening for Earth back in 2011, and each performance since then has been better than the last. Sadly this particular night seemed as though it might be the last time, at least for the foreseeable future, but Oak certainly made the most of it. Compared to some of the others out there, these guys start off sparser with softer drones that stretch out for long periods of time and then slowly add in new levels until they’ve reached absolutely crushing levels that rival anything else in the genre. It’s perfect in a live setting, as the louder volume allows the droning to hover over you with a thicker atmosphere that sticks with you for the entire performance. During some of the climaxes Oak’s guitarists showed off some riffs that had more of a blues influence than I remember, and it made the set very memorable. But even with the sparse droning that leads up to immense death/doom climaxes, my favorite element of this band’s music remains Jo Gonzales. He has one of those pitches that starts off very abrasive and only seems to get even more twisted and distorted as the songs stretch onwards. There’s a perfect balance of high/low screams and the unpredictability of the screaming gives Oak a very unsettling feeling that cuts through the instrumentation and continually grabs your attention. I hope this isn’t the end for them, but if it is they have definitely gone out on a high note. I’ve spent quite a bit of time listening to Volahn over the years, but Brooklyn’s Vorde was a band I wasn’t that familiar with. In advance of the show I spent the better part of the day taking in the spacey atmospherics and harsh blasting that their self-titled debut had to offer, and by the time the evening came around I was very excited to see just how this material would translate over live. But even with that amount of hype going in, I wasn’t prepared for what was to come. After a short sound check the band flooded the venue with fog and their singer stepped out into the middle of the crowd. As the music kicked in, it became clear that he was holding a machete and started waving it around throughout the set. Right from the beginning it gave Vorde’s set a very different from the norm, as having a machete waved around and struck against the ground just a few feet in front of you adds a good deal of tension to the performance and gave an almost ritualistic vibe that seemed fitting for this type of music. I found myself completely absorbed in everything that was happening, and as the singer seemed to be channeling otherworldly spirits the rest of the band was delivering layers upon layers of sprawling black metal that was equal parts hypnotic and abrasive. I’ve got to give credit to the instrumentalists, as these guys can play fast and never let up for a second throughout the course of their set. The vocals are about the closest I’ve ever heard someone come to Attila Csihar’s pitch, which comes off almost like a droning chant at times. Though this particular style tended to get buried underneath the wall of sound during the performance, there were specific moments where it would break free (and it certainly helped that I wasn’t standing too far from the singer for the entire set). The underlying ideas of Vorde’s music are familiar, but the unpredictability of some of the transitions and spacey, hypnotic tonality of the instrumentals help them to stand out for me. And with the performance from the singer adding tension to the performance, it felt like I was watching more than just a band playing in front of me and something closer to a ritual of the dark arts which is what continues to draw me to this genre. Vorde had me picking my jaw off the floor after their performance, and I found myself wondering how Volahn would be able to follow it up. For those that may be unfamiliar Volahn is the solo project of Eduardo Ramírez, one of the major contributors to the Black Twilight Circle. Over the years his material has taken elements of the second wave black metal framework and blown them wide open, incorporating elements of Mayan and Aztec culture into the music that gives a mystical, warrior feel to many of the riffs. Rather than going for the intense ritual feel on and off stage like Vorde did, Volahn instead chose to let the music speak for itself and delivered a lengthy set filled with stunning musicianship and more twists and turns than I could keep track of. It’s clear that he has surrounded himself with a very capable backing band for live performances, as despite how fast and intricate his guitar work is on many of the songs there were never any missteps and they were always able to keep up. In a live setting the distorted riffs seemed even more abrasive, but there was still plenty of space for the cleaner sections to break through. These moments are what really made the set stand out to me, and it’s why this project continues to intrigue me from one release to the next. During many of the songs the sprawling abrasive waves subside and the lead guitar incorporates some cleaner melodies that have a classical feel to them. It’s the type of instrumentation that you can get completely lost in, and in a live setting these are amplified and fully envelop you with a warmer and inviting feel that is quite different from what is typical for this genre. Even though the instrumentals move between distorted assaults and softer sections Volahn sticks with a harsher scream the entire time, but it works perfectly and adds that extra bit of intensity and grit to what the band has to offer on-stage. Like with Vorde, during this set the vocals would occasionally get drowned out too but always seemed to break through at key moments. I could’ve watched this for hours had the group wanted to play for that long, and there’s something to be said for black metal that’s able to venture out into different territory and offer a stunning level of atmosphere through sheer technical ability.